For a contemporary look, we manufacture Stainless Steel Balustrading. This can include wire and glass components, which can be used for pool fencing, or internal Stainless Steel railings. Stainless Steel is suitable for use indoor and outdoor, and we can also electro polish the Stainless Steel so that minimal cleaning is then required. Our Stainless Steel selection is for both domestic and commercial clients. We are well equipped to produce Stainless Steel balustrading for large scale projects. 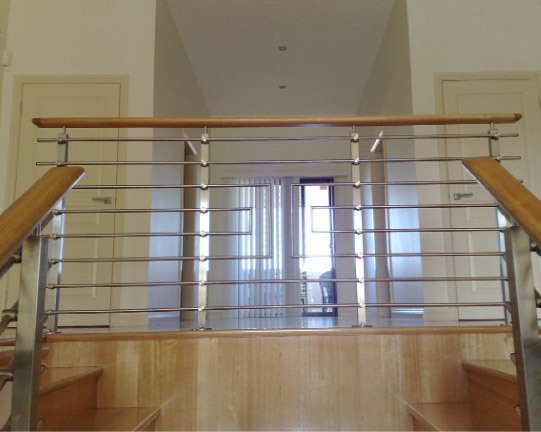 We design and manufacture wrought stainless steel balustrades and railings for homes and business's around Sydney, Including Western Sydney, The North Shore, Inner City, and South Sydney.